Like many others, I was pleased to hear newly-appointed Minister for Children Charlie Flanagan announce plans to examine legal reforms that would allow people who were placed for adoption as children to trace the identity of their natural parents. The right of children to an identity is protected by Article 8 of the UN Convention on the Rights of the Child, and it is difficult to see how this right could be vindicated by the current regime, whereby adoptees have no right to any information regarding their origins. 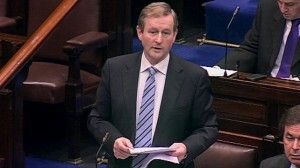 On Wednesday, howe ver, Taoiseach Enda Kenny threw a spanner in the works by announcing in the Dáil that since mothers who placed children for adoption have a constitutional right to privacy, addressing the issue might require a referendum. This is a familiar claim when calls for reform are being resisted; Governments are fond of attributing their inaction to constitutional restrictions. In this case (as in many others) the claim does not survive scrutiny. The Supreme Court directly addressed the issue of adoption tracing in IO’T v B  2 IR 321. In that case, the Court accepted the plaintiff’s argument that the right to know the identity of her natural mother was one of her unenumerated personal rights under Article 40.3 that flowed from the natural and special relationship between the mother and child (per Hamilton CJ, pp.345-348). The Court accepted that the exercise of this right might conflict with (and be restricted by) the mother’s right to privacy, but stipulated that the natural mother did not have an absolute constitutional or legal right to have the anonymity guaranteed to them at the time they placed the child for adoption preserved (per Hamilton CJ, p.354). Since adoption tracing is a classic case of reconciling competing rights, it is a matter for the Oireachtas to deal with; the presumption of constitutionality will apply with “particular force” to any legislation, and the decision of the Oireachtas should prevail unless it lacks “reasonable proportion”. Even the dissenting judgment of Keane J (at p.379) expressed a preference that the matter be dealt with by the Oireachtas rather than the courts, since it enjoys the advantages of expert guidance and democratic mandate. Thus, it is difficult to envisage a court striking down any legislation enacted on this point. I have previously criticised this Government for claiming that a referendum is necessary to introduce marriage equality, when ordinary legislation would (in my view) suffice. However, at least on that issue, the argument is relatively intricate. By comparison, this issue is quite clear cut – so why did the Taoiseach suggest otherwise? Were his remarks off the cuff, or were they based on advice from the Attorney General’s office? Either way, the statement is the latest in a long line that indicates a worrying attitude towards the Constitution on the part of Irish parliamentarians. At best, they make little effort to engage with and understand the Constitution, deferring entirely to the Attorney General’s office and simply parroting legal advice. At worst, they cynically (and often misleadingly) use the Constitution as an excuse for refusing to do things they don’t want to do. Eoin Daly has criticised what he calls the over-constitutionalisation of Irish politics, whereby ordinary political issues are elevated to constitutional ones. 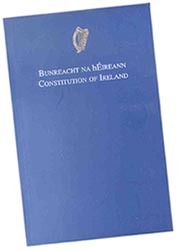 In a sense, however, the problem could also be described as an under-constitutionalisation of Irish politics; the refusal of elected politicians to engage in meaningful constitutional dialogue and argument results in anything labelled “constitutional” being seen as separate to and outside the scope of politics rather than as an integral part of it. It would be nice to see a reference to the Constitution being used to spark debate in Leinster House, and not as a conversation stopper. This entry was posted in Oireachtas, Referendum. Bookmark the permalink.